When the time comes, jump on Twitter and search for the hashtag and follow along on the “Latest” tab. If you plan to tweet a lot during the chat, it’s not a bad idea to send out a brief message to your followers letting them know that you are attending a Twitter chat. A simple polite warning such as the one below will do. 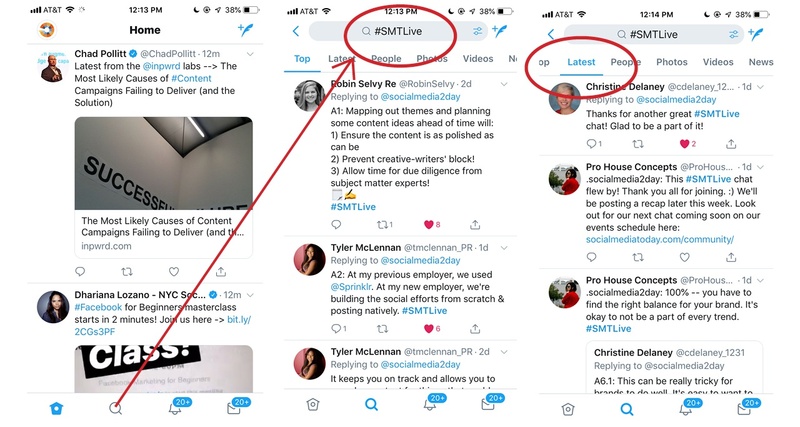 Gonna see an influx of tweets from #SMTLive – hello all, joining late. Argh! I’m Carmen, I lead Cisco’s Talent Brand @WeAreCisco channels – all about employee voices to attract talent! ???? You’re already on the hashtag stream (step 3) so all you need to do now is read along. You may have to refresh often as the conversation continues. When you’re ready to join in, you can either reply directly to the tweet of the question or tweet a singular tweet referencing the which question this is the answer to. For example, if we say “Q1…” you should respond by saying “A1…” and so on. The #1 rule to always use the hashtag in every one of you tweets. (ex: #SMTLive) If you don’t nobody will see it.